Zebco has been America's most trusted reels for over 50 years and now have expanded there line to provide the needs of the modern day fisherman! Zebco's 808 Bowfisher reel is a heavy spincast reel with all metal gears which is perfect for the average wear and tear of bowfishing. This 808 comes pre-spooled with 80lb braided line and has a changeable right or left hand retrieve to be as versitile as an angler needs. So if you are looking for a reel to complete your bowfishing rig the Zebco 808 Bowfisher is it! Zebco has been America's most trusted reels for over 50 years and now have expanded there line to provide the needs of the modern day fisherman! 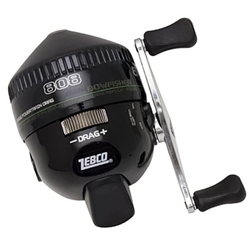 Zebco's 808 Bowfisher reel is a heavy spincast reel with all metal gears which is perfect for the average wear and tear of bowfishin. This 808 comes pre-spooled with 80lb braided line and has a changeable right or left hand retrieve to be as versitile as an angler needs. So if you are looking for a reel to complete your bowfishing rig the Zebco 808 Bowfisher is it!